Twenty four people, including 12 security personnel, were injured on Monday in clashes between stone-pelting students and law enforcing agencies in the heart of Srinagar, on a day colleges reopened in Kashmir after a five-day shutdown ordered by the government. IMAGE: The violence was witnessed on a day the colleges reopened in the valley after a gap of five days. 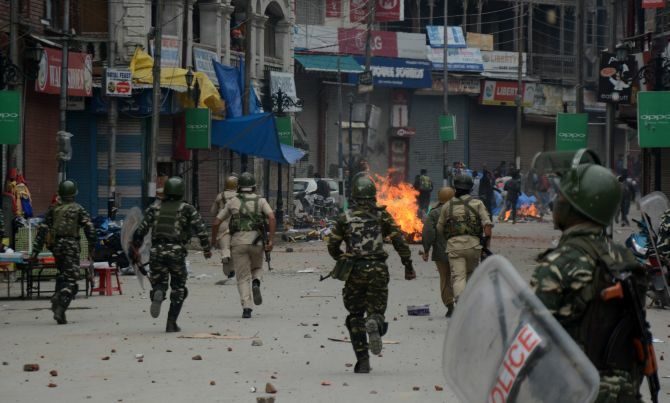 The upmarket Residency Road and adjoining M A Road in Srinagar turned into a virtual battleground as students clashed with police shortly after colleges reopened. 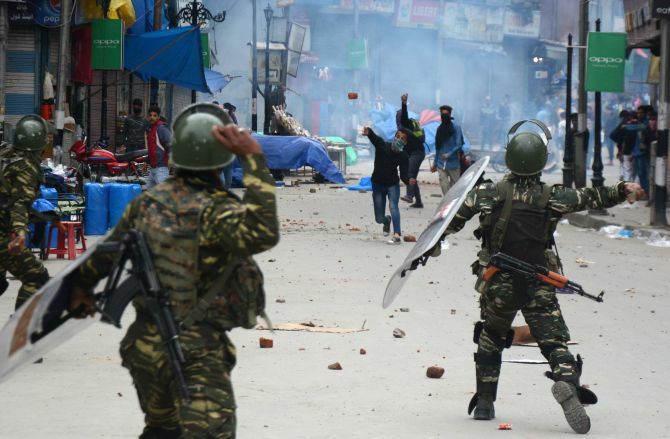 A police spokesman said the security forces came under heavy stone-pelting which resulted in injuries to 12 personnel including three officers. 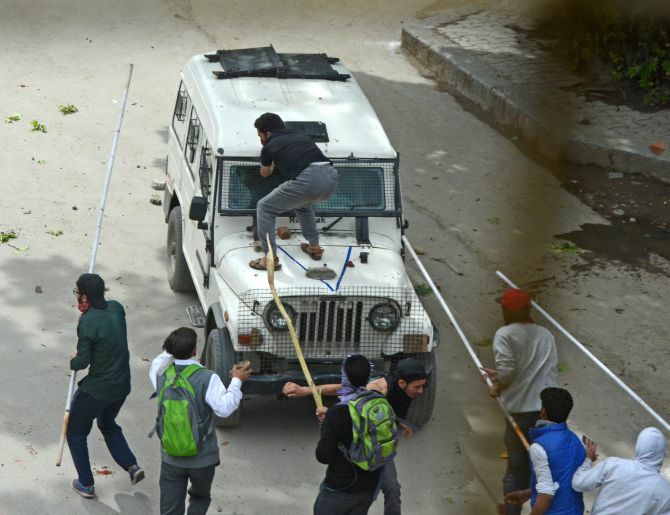 IMAGE: Students hit police vehicles during clashes. “The miscreants and the students pelted stones on Traffic Headquarters and attacked police vehicles with stones clubs and lathis. The police showed utmost restraint,” he said. 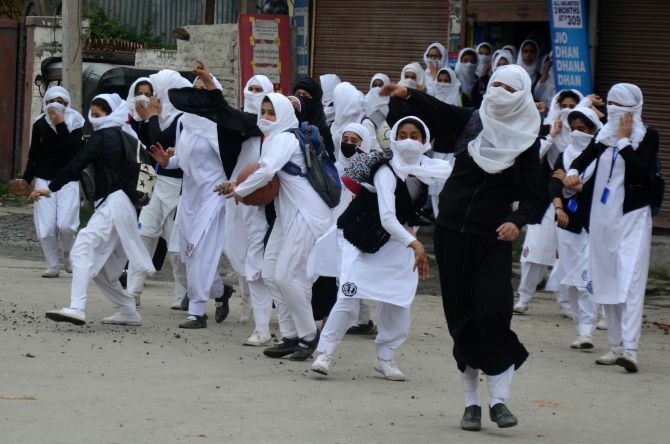 IMAGE: Girl students run for cover as cops fire tear smoke shells. “Some boys involved in stone-pelting were caught on the spot and detained by police,” the spokesman said, adding the mob was dispersed and normalcy restored in the area. Other officials said several students, passersby and a photojournalist were also hurt in the clashes. IMAGE: The clashes emanated from S P College and soon spread to the streets of Regal Chowk and adjoining areas. Police had to fire dozens of tear smoke shells in an attempt to disperse the protesting students from S P College and Women's College on M A Road, the officials said. 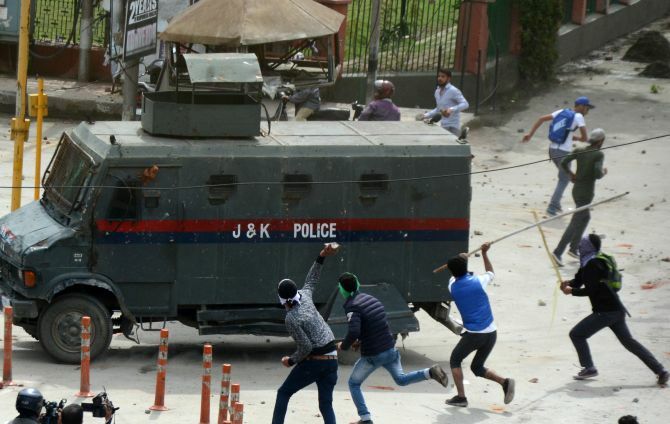 The clashes began from S P College and soon spread to the adjoining areas, the officials said. The students from nearby Women's College also joined the protests, which spread to other parts of the commercial hub including Lal Chowk, Red cross road and Maisuma, they said. IMAGE: The clashes led to closure of the market and the people rushed to safer locations out of the commercial hub. The clashes led to closure of shops in the prime commercial hub and the people rushed to safer locations, the officials said. The violence was witnessed on a day the colleges reopened in the valley after a gap of five days. 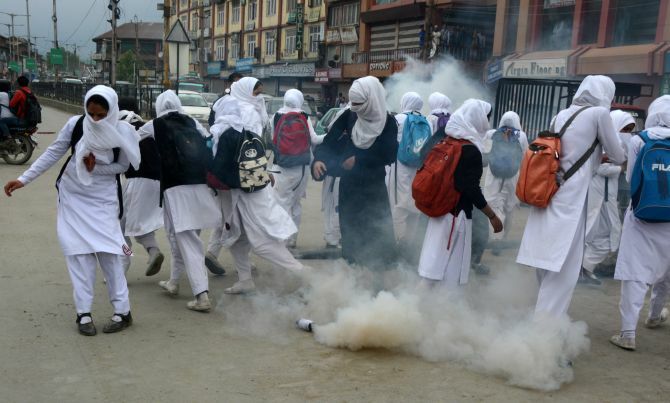 The authorities had shut the higher educational institutions as a precautionary measure in the wake of widespread violence by the students in Kashmir on Monday against the alleged high handedness of security forces with students in Pulwama on April 15. Should US mediate in the Indo-Pak dispute?